Using the adhesive supplied, our markers can be easily applied to metal, concrete, asphalt, or just about any flat non-soil surface. 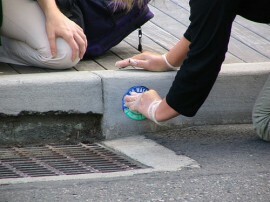 Please ensure that the markers do not present a trip or slip hazard – especially in public areas. Step One: Clean the surface. 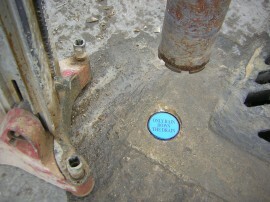 Step two: Apply the das adhesive supplied to the Adhesive Guide on the rear of the marker. Step three: Permanently stick the marker to the surface. 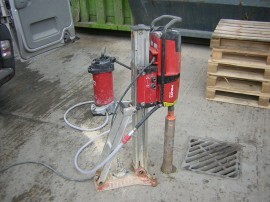 In heavily trafficked areas the markers can be set within a shallow core. 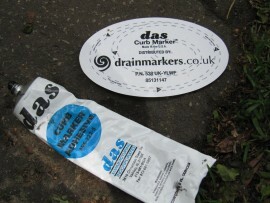 Our drain markers help you save time and money, and prevent pollution. All our markers are covered against defects by the manufacturers’ 12 year warranty. Yellow fish markers help protect the Dighty Burn. In support of the yellow fish campaign, we’ve introduced new Yellow Fish markers; See our community markers page for more details. Please get in touch if you would like further information or a sample marker.